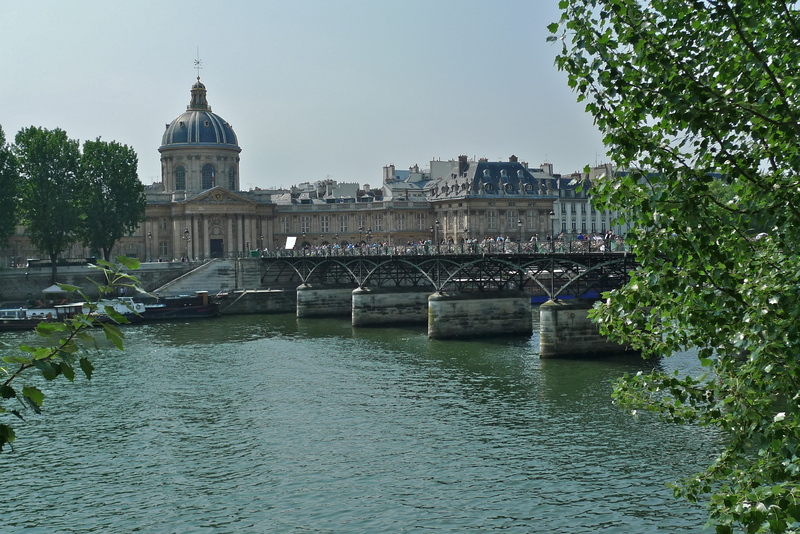 THE PONT DES ARTS is one of many delightful bridges in Paris. 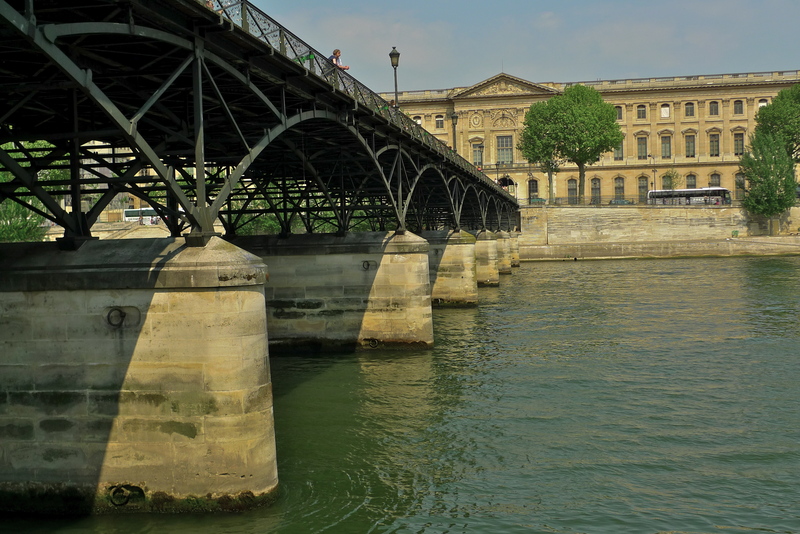 It’s an iron-framed, wooden-floored, footbridge spanning the Seine from the Louvre to the Institut de France – a symbolic conjoining of knowledge to power. The original Pont des Arts was built at the beginning of the nineteenth-century and comprised an iron framework with nine arches. Over the years it suffered structural damage from a succession boats colliding into it and from aerial bombardment during two world wars. In 1977 the bridge suffered a partial collapse after being hit by yet another barge. This proved to be terminal and the bridge was rebuilt between 1981 and 1984 preserving the look of the original bridge but reducing the number of arches from nine to seven, presumably to give the river traffic a fighting chance of negotiating the bridge without damaging it. 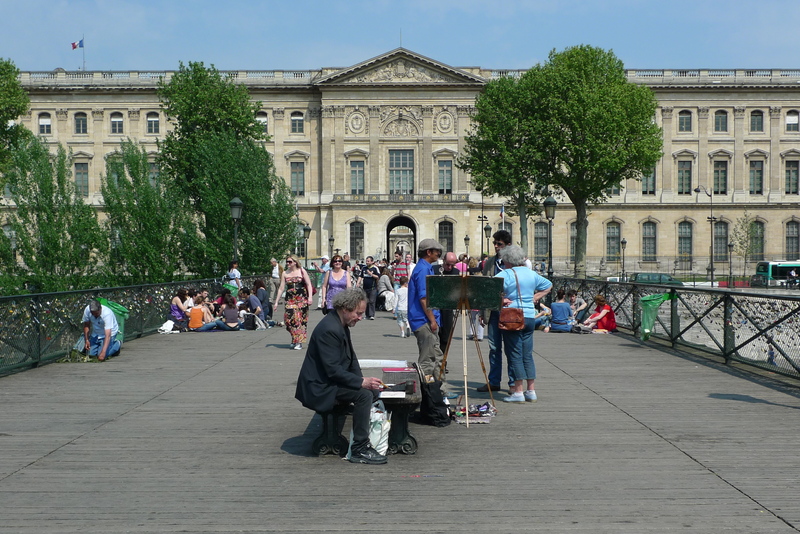 Today, the Pont des Arts is a favourite with artists, photographers and of course, tourists, taking advantage of the unique view along the Seine while the working barges and pleasure boats rumble past on the river below. 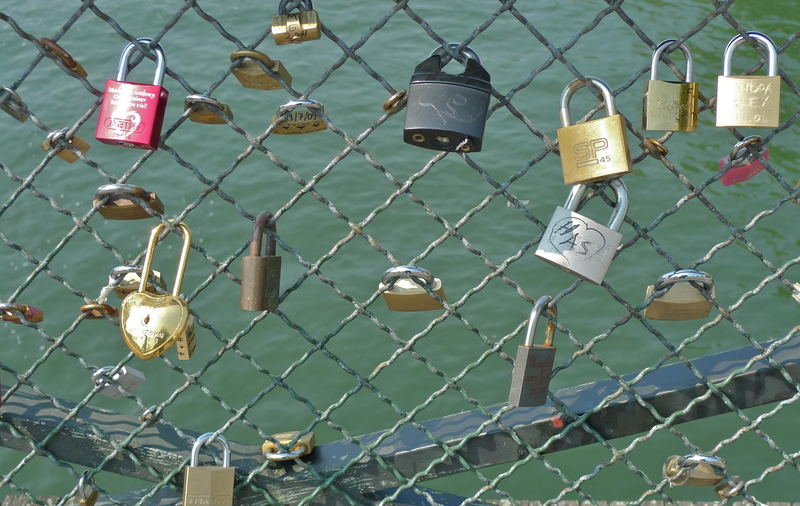 A relatively new feature to be found on the Pont des Arts, as well as on some other bridges in Paris, are the cadenas d’amour – the love padlocks. Love them or hate them, there they are – love tokens locked to the bridge by couples who have thrown the keys into the river. The Paris city authorities are not in favour. They say the practice “poses the question of preserving heritage,” and that “in time, these padlocks will have to be removed”, … “the rusty locks are becoming an eyesore on one of Paris’ most photogenic monuments.” I’m inclined to agree. In conciliatory mood, the Paris authorities say they will only remove the padlocks from its bridges once it has come up with an “alternative solution”. One possible solution might be to install one or several iron, tree-like structures, as has already been done in Moscow for example, where people can hang their padlocks. The Pont des Arts is a delightful structure and, personally, I think that the cadenas d’amour add nothing to its charm. They seem to be impossible to escape from. Even viewing the bridge from below and with the magnificent façade of the Louvre in the background these trinkets are seen to litter the bridge. But, I’m sure there are those who think the cadenas d’amour have a charm of their own – not least the people, now long gone, who left them there in the first place.